It was my first time at Epidaurus theatre, and I was awe-struck by this massive theatre that seats up to 13,000 people. It was built in 350 B.C by Polykleitos and it was dedicated to Asclepius the god of healing and t is the best preserved ancient theatre in Greece. It’s in an isolated region of the country side of Argolid for good reason. This place was a sanctuary for the sick from all over who arrived here to get closer to nature and to be healed by the natural surroundings. They stayed at the nearby temples just few metres from the theatre where they could exercise, relax and consult the priests. The reason for the theatre being here was because it was thought that the sick people would be healed by watching the tragedies as it would be a very cathartic and therapeutic experience for them. Also, the theatre is famous for its great acoustics and many tourists like to stand in the middle of the stage and clap or talk loud. The noise can be heard all the up to the last row of seats. Ancient theatre is still performed here and many famous actors and actresses have performed at this sacred spot. 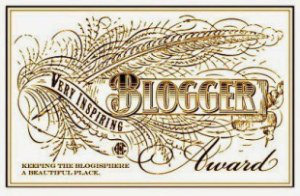 Just when I thought that the universe was conspiring against me, I went on my blog and found out that I have been nominated for the ‘very inspiring blogger’ award. Yes, the universe loves me! (haha!) Such a great honour! Being able inspire people is a tremendous gift and it was one of the main reasons I started this blog. A big, big thank you to the very talented Artist Karen http://idoartkarenrobinson.com for nominating me! Her colourful work gave me more incentive to continue on my creative way. Sometimes when you blog you feel like you’re talking to a wall and you’re not sure who is listening, so it’s wonderful when people recognize you and appreciate what you do. 1- Thank the person who nominated you and add a link to their blog. 2- Display award on your post. 3- List award rule’s so your nominee’s will know what to do. 4- State 7 thing’s about yourself. 5- Nominate 15 other bloggers for the award. 6- Contact your nominees to let them know you have nominated them. Provide a link to your post. ( or buttons ) on your blog, whether in your side bar, ABOUT page or a special page for award’s. 1. I am a huge dreamer, and it’s a problem..
2. I have had a passion for photography since I was a child, but I didn’t take it more seriously until I began this blog. 4. I have a university degree in Cultural Anthropology. 5. Stray cats take advantage of me. They know that I’m a sucker! I recently saved one death. So proud! 7. My signs, in case you were wondering: Virgo, Sheep and Flamingo. There are so many phenomenal blogs, and it was so hard for me to choose. Many of the following really kept me going and some where commenters from the genesis of my blog. Thanks again to Karen for her support! 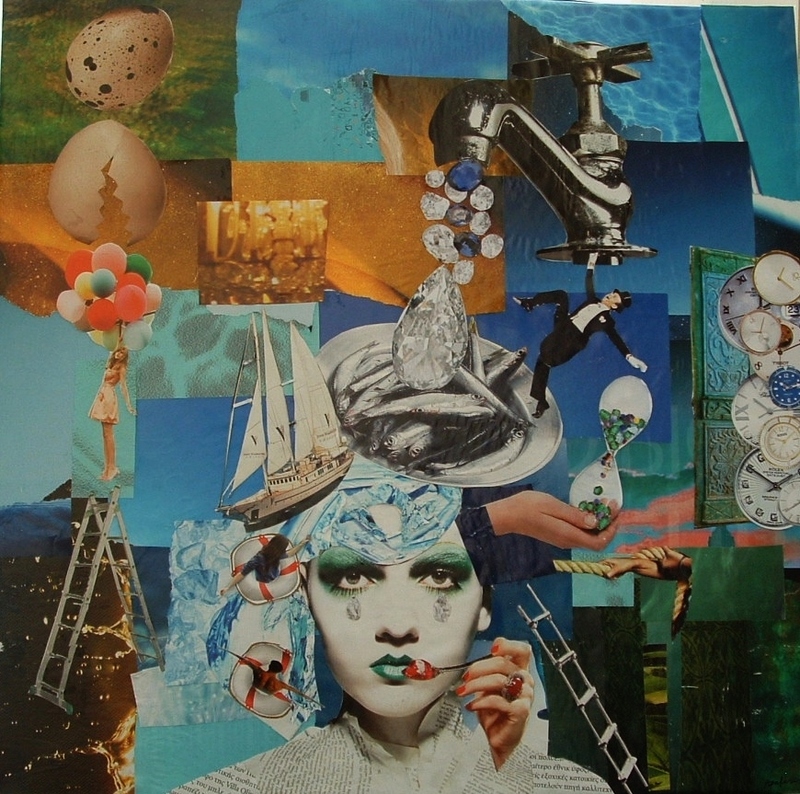 In this collage I used bits of torn blue paper from magazines for the sky. 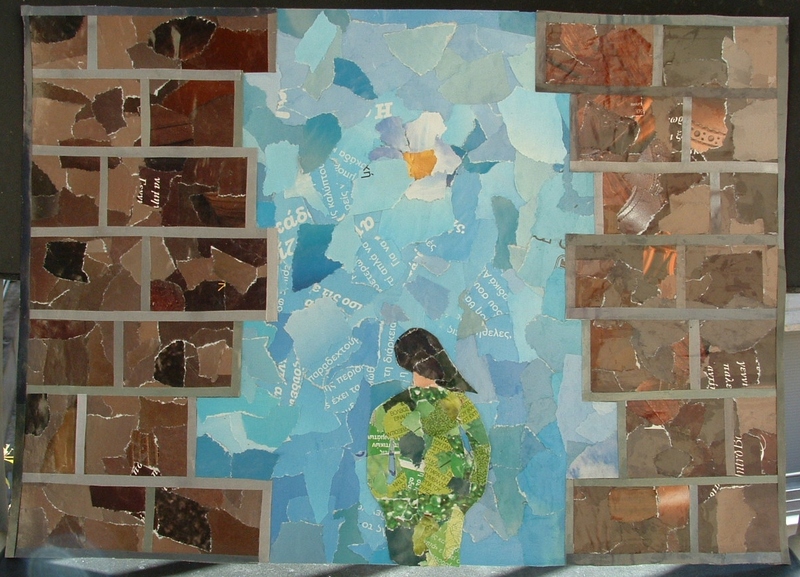 Torn bits of brown paper for the bricks and green for the females’ dress. 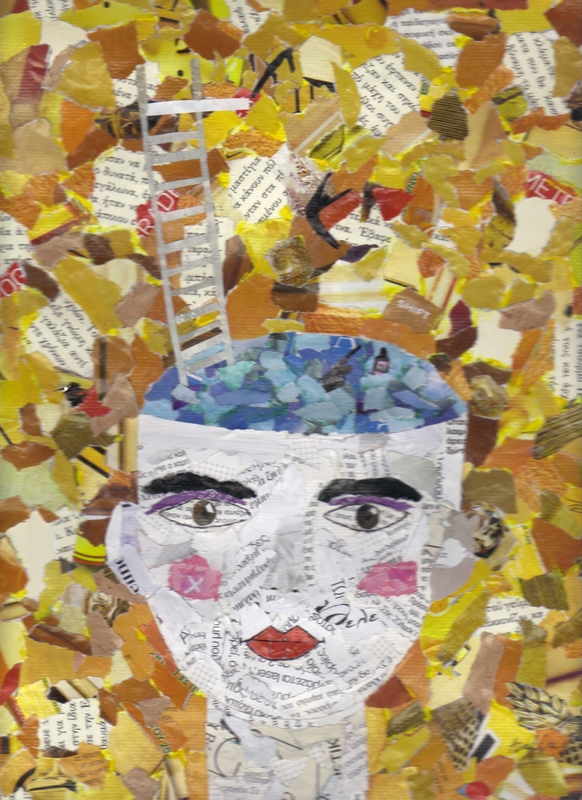 The papers were glued on 34 x22 cm cardboard paper. Today, I participated in an a webinar hosted by ‘clothpaperscissors.com’ . I learned how to make a three-layered heart collage using cardboard paper, text, pen and pencil, gesso, ribbon a hole puncher and glue. I didn’t have the right fabric for the second layer so I used bits of red coloured paper. 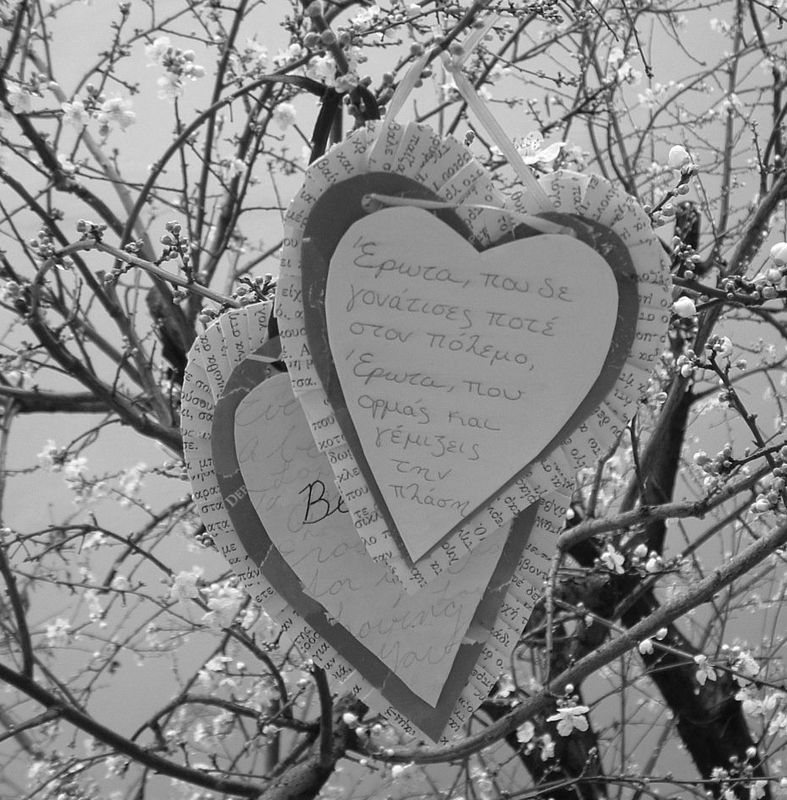 For the smallest heart you can write a love poem or quote. There are so many things that you can do. I was very inspired and will probably make more for friends and family. It’s a nice little gift to give to someone you love. You can hang it anywhere you want. 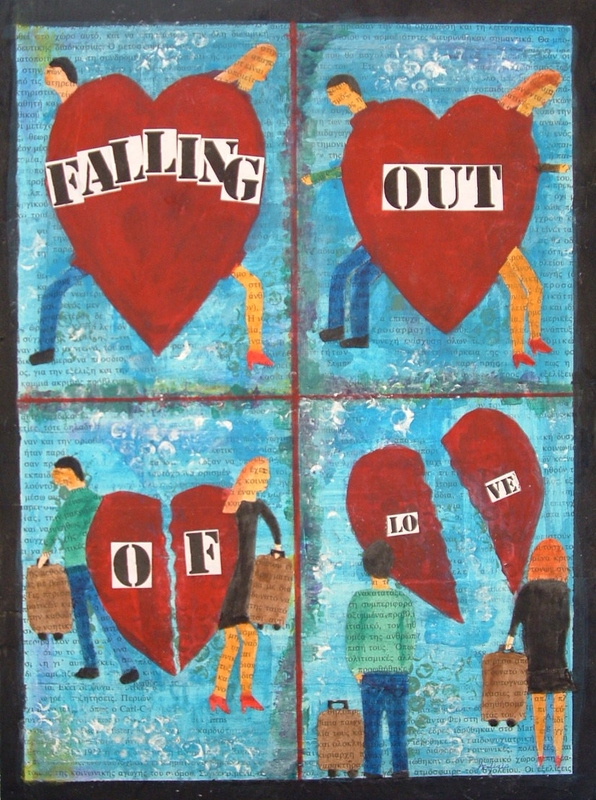 My first painting of the new year is a mixed-media painting. I don’t usually paint faces. I do make sketches and I will be painting more faces in the near future. 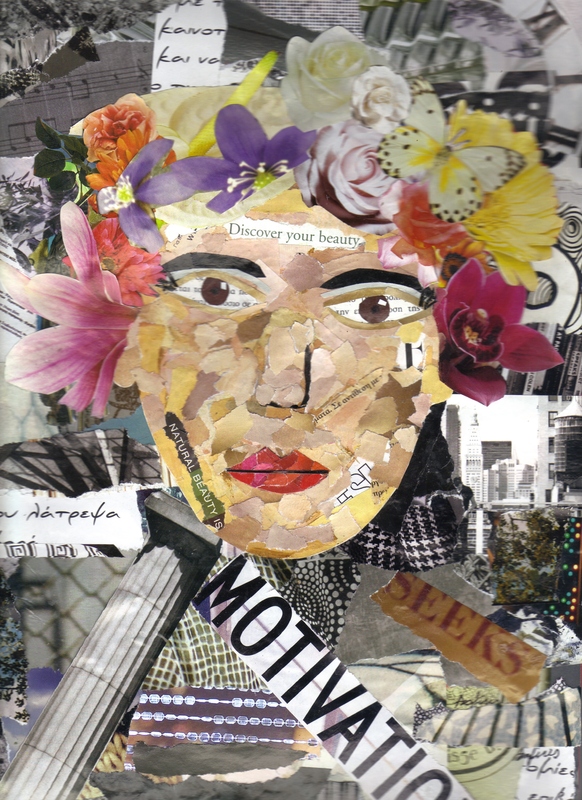 I mostly enjoy ripping paper to make collages, but I thought I’d take more risks and stretch myself more. For the painting I used leaves from my garden to use as stamps for the background. 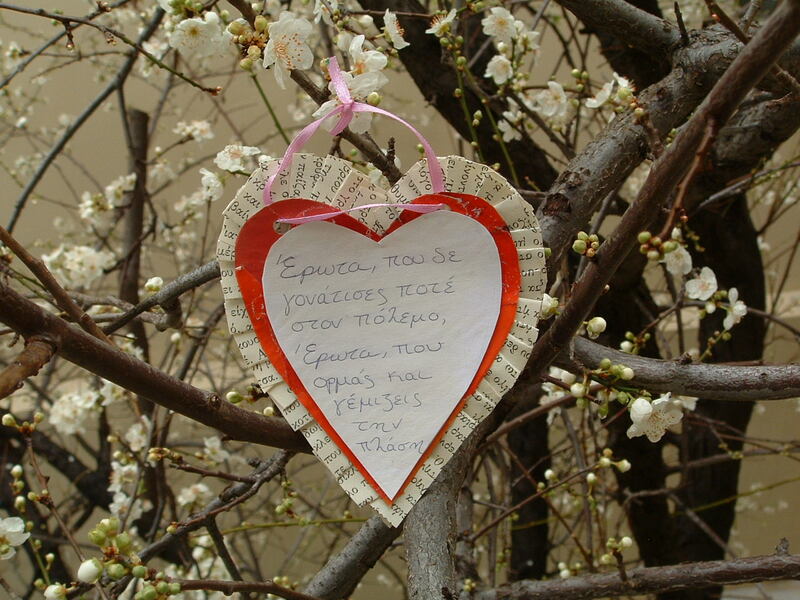 The climate in Athens is different from Western Europe and Northern Greece which is why I was able to gather leaves in the winter. 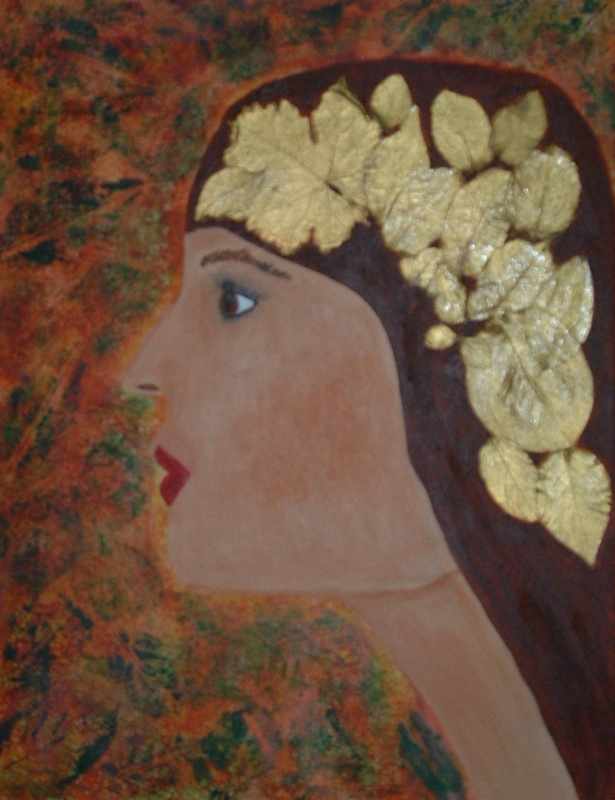 I painted some of the leaves gold and glued them on the canvas. The gold leaves became a headdress and it shines beautifully in the light which I am glad the photograph captured.